Home Moto Jorge Martín has already seen KTM: "The Top 10 is a realistic goal"
Jorge Martín has already seen KTM: "The Top 10 is a realistic goal"
The Moto3 champion shines his new colors: "I am very proud to be part of the best team in 2018, I hope to achieve great things". You have had time to savor your Moto3 title, now Jorge Martín must focus on his new and demanding task: to be competitive in Moto2. I could not be in a better team to get it. 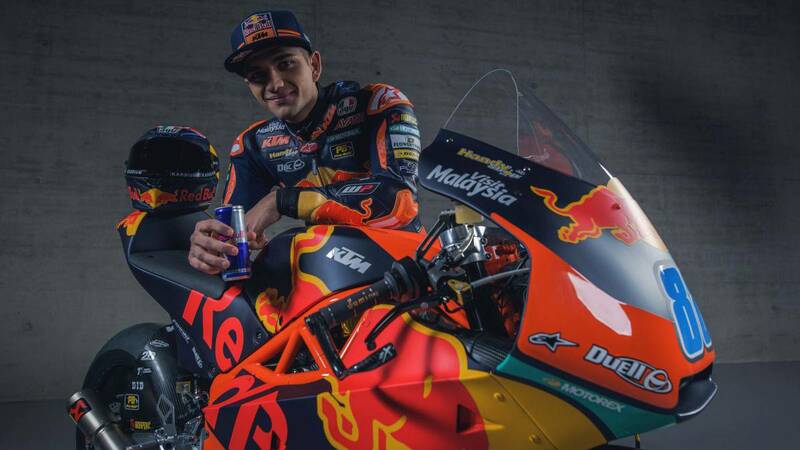 He is Brad Binder's partner in the Red Bull KTM Ajo, a priori, the strongest team in the category. "Being part of this team is incredible, it was the best of 2018 with a very competitive bike and a very powerful factory. I am very proud to be part of this great family and I hope we can achieve great things together," says the Madrid native dressed in his colors. From the start, Jorge is marked to be in the top ten each race: "It's my first season in Moto2, so my main goal this year is to learn as much as I can, I will work hard and give my best Finishing in the Top 10 would be a realistic goal, so we'll go for it. Although my first experience with the bike was short, the feeling was very good, I trained hard this winter and I can not wait to start. " On February 18 and 19 she will return to her new bike in a private test in Jerez after falling and suffering three fractures in its premiere with her.